There was no other location as challenging as this one in the entire competition! Beşiktaş has just show how to build a new stadium without losing historical identity. While most stadiums in Turkey are being built in new locations, Beşiktaş opted to stay home, in their own district of central Istanbul. Here they faced immense constraints of local roads, high water table, legally imposed height limitation and several major historic landmarks around. 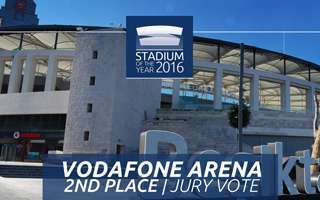 What they did despite these obstacles is widely praised by our Jury, earning Vodafone Arena its second spot in the Jury Vote. It’s not the same stadium that used to stand here for decades, quite the opposite. Everything was built from scratch and despite very limited space they managed to create a seating bowl of almost 42,000 people. Perhaps most importantly, the stadium simply deserves its place after legendary Inonu. In fact, Vodafone Arena was ranked higher than any other stadium in the “relation with surroundings” category, scoring 7.6 out of 10 on average. Only two other stadiums in our competition’s history were ranked higher, one of them designed by our Jury member Peter Bordas. “I applaud the considerable suppression of the mass of this stadium into the hillside in response to delivering an appropriate scale to street level and the stunning context of the location. The constraints of the site and construction were considerable and the club and contractor team clearly had huge issues to resolve in delivering this stadium. The facade is simple and restrained with appropriate materials for the city, the historic context and a new major building of civic status. I imagine the steep bowl profile and close pitch proximity delivers an excellent atmosphere.” says Andy Simons (KSS) and his words seem to be reflected by attitudes of Beşiktaş supporters. Don't forget to check the complete list of 29 nominees (Public Vote) and 10 finalists (Jury Vote)!